Jasper is the place to visit if you want to see Ospreys. They nest in specially constructed artificial 'trees' by the river and can often be seen flying over the town. The pink flamingoes on some telegraph poles are to stop the Ospreys nesting on those poles. An early morning walk around Jasper townsite yielded lots of Pine Siskins, one White-crowned Sparrow and a Willow Flycatcher. Other town walks added Clay-colored Sparrow, Violet-green Swallow, Wilson's Warbler, American Robin, American Crow, Purple Finch and Cassin's Finch. The highlight for us was a displaying male Rufous Hummingbird. Despite there being lots of feeders about we did not see one feeding. They move incredibly fast and are fantastic birds. The best place we found for them was Patricia Street. Near to the town is Maligne Canyon. This is another Black Swift site. Although very quiet birdwise, as well as the Black Swifts, we saw Dark-eyed Junco, Yellow-rumped Warbler and an Ovenbird. The outflow from Maligne Lake (not visited) can be a good site for Harlequin but we were there too late in the year to see them. Nearer Jasper are Patricia and Pyramid Lakes: at first sight two desolate areas of water. Pyramid did hold a pair of Red-necked Grebes, Great Northern Diver and a male Surf Scoter. A small pool by the road to the lakes held Ring-necked Duck. If pressed for time the one place to visit in Jasper is Cottonwood Slough (pronounced sloo). This is an area of woodland, marsh and pools created by Beaver dams. We heard more than we saw here, and it's very hard to find singing birds in the trees. The pools held a fine summer Black-necked Grebe, Ring-necked Duck, a pair of Hooded Mergansers and Green-winged Teal. The haunting call of the Great Northern Diver can also be heard here, from birds on the bigger lakes. The woodland walk added Three-toed Woodpecker, lots of Least Flycatchers and at least one Hammond's Flycatcher, Common Yellowthroat, Red-winged Blackbird, Chipping Sparrow, Song Sparrow, Brown-headed Cowbird, Swainson's Thrush, Hermit Thrush, White-throated Sparrow, Yellow-rumped Warbler, Mountain Chickadee and Eastern Kingbird. 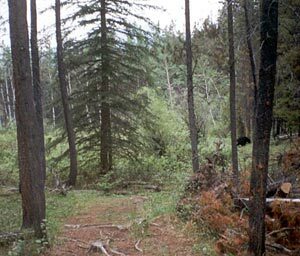 The path also held a large male Black Bear! (the darkest spot on the photograph).